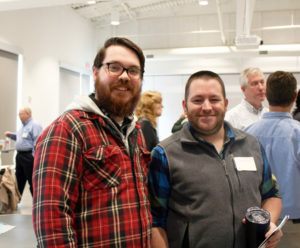 Anthony DePriest, Landscape Designer, has been with McClure since his graduation from Kansas State University where he received a Masters of Landscape Architecture in 2018. DePriest works on pre-planning with site analysis and map creation through sketching and generating ideas in schematic design, planting and hardscape selection in design development, and finally construction detailing and documentation to make their ideas a reality. Q: What inspired you to pursue a career in Landscape Architecture (LA)? A: My initial affinity for the outdoors grew throughout my time in the Boy Scouts of America and through sports. My interest in the environment turned me towards the design of space and how people interact with their surroundings. After high school, I enrolled at Kansas State with the intention of going through their architecture program. In the first year of the program, I sampled design projects that included architecture, landscape architecture, and interior architecture, which ultimately led me to pursue a career in LA at McClure. Q: What is Landscape Architecture to you? How is it incorporated at McClure? A: To me, landscape architecture is the process of designing open-spaces that interact and work with people. At McClure, we work with engineers and our Creative Placemaking Group to create more opportunities for people to interact with and be a part of a healthier environment. Q: Are there any specific examples of LA in Kansas City that inspire you? A: I think that Kansas City has a lot of opportunities for landscape architects to influence the growth of public spaces and how people interact with the built environment. The Power and Light District is a great example of transforming vehicular orientated spaces into pedestrian areas. 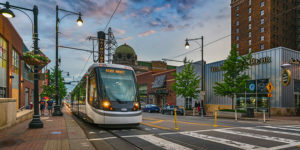 The effect of that transformation, combined with the addition of the streetcar, shows to openness that Kansas Citians are willing to adapt to these new environments and take the city back from cars. The change in mindset to this new urbanism in the city inspires me to be a part of that change through the designs we develop here at McClure. Q: Even though you’re in an office of around 60 people, what’s it like being a part of a small team? A: Working on a small team is a unique experience. Being one member of a two person team allows me to work on all aspects of design, from very early planning stages to construction documents. It’s helped me gain a lot of experience and get a perspective into areas like proposals and administration that I normally wouldn’t see if I was a part of a large team. Q: Is there anything you’re excited for on the horizon? Q: Do you have any advice for students approaching graduation who are hoping to pursue a career in LA? A: My advice for those graduating is to study what exactly it is about landscape architecture and design in general that inspires you and find firms that strive in that area. If you have questions about McClure’s Landscape Architecture services, please contact Greg Pfau at (816) 756-0444 or gpfau@mecresults.com.